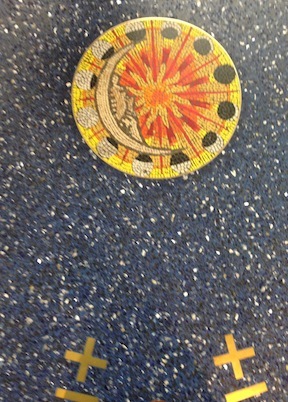 No carpet At Kansas City International, but here’s a picture of their linoleum. Hilarious carpet montage. My husband once took a photog class from a woman who took snapshots of the pavement as she drove from fro Oregon to Arizona….she was a very good photographer. Just wanted to let you know that a children’s librarian sent me a ton of books by YOU that her kids wanted for their library in Pendleton, Oregon……I get to read them before I send them on and though I am not the right demographic ( i.e. I am 67) I thoroughly enjoyed Ivy and Bean Take The Case……I can see why this series is such a hit…keep writing, your admirers are waiting. You sound like Bean with all these photos of airport carpets!! BUT– I act more like the real-life Bean! Quick! To Portland before they tear the old carpet up. Then to Oakland for the fabu terrazzo.